Well, yes...the 8-Speed is an extremely competent transmission, being able of achieving virtually anything you can imagine. From smooth-as-silk yet reasonably fast shifts, to totally instant and rocket-fastThe shifts with a sportive touch. So, yes...doing maps for it, that we judge being better by ourselves was not an easy task. Actually we spent over 6 months just with Re-Mapping in car. Through this period we accumulated over 10.000 kilometers (approx. 6200 miles) on our F31 test-car, while having the laptop on the passenger seat. What did take so long? Well, XHP standard is not to just remove some torque limiters or raise line pressure a bit. Our standard is to actually improve the driving experience you have on a daily basis with your car. Thats what xHP stood for in the past, and thats what we always want to achieve when doing setups. While removing a torque limit or helping the trans to hold a bit more power may be important for the minority of people that run double the stock power on their car, this does not help anything for people with stock power cars, nor will it actually get you more fun when running a car with a bit more power than stock. It gets you a better feeling, that you did the right thing to prolong your transmissions life when running an engine tune, but that won't put a smile on your face every day. So what do we do with our maps? The answer is simple, the way is complicated: We not only "tune" the transmission, we change the rules how it behaves and how it reacts to driver inputs. Thats where the DEC-Switch comes into play. The majority of F-Series cars come equipped with it. DEC stands for "Driving Experience Switch" and lets you adjust your cars behaviour on the fly from the drivers seat. The settings are Eco-Pro, Comfort, Sport and Sport+. So unlike as in most E-Series 6-Speed cars, where the transmission had a fixed map set for D-Mode, S-Mode and M-Mode, we can now combine those modes in the F-Series cars with the 4 positions of the DEC switch. This gives you a total of 12 operating modes, you can access instant from your driver seat. Just like you aren't in the same mood every day, your car does not have to be the same every day. It can run full economy style on your commute to work in traffic-jam, while at the same time can be a total beast with rocket-fast shifts and intense throttle-blipping on downshifts just with the flip of a button. That is an awesome tool made by BMW, so people can adjust their cars to their likings. But now starts the "bad" news: BMWs are made for a wide-spread of people/target groups and yeah...they do make compromises, even if all options are at hand. In general, only their M-Cars get the full potatoe. Everything else gets restricted a bit here and there. This means you don't get the last bit of performance on a lower model, even if the transmission could do it. Or they restrict the amount of modes you can access through the DEC, just because marketing-department says: "No, thats too extreme for that target group". So let's explain it with an example: The 335i (same goes for M135i and M235i) accesses the same transmission mode, when putting the gear-lever in S or when setting the DEC to "Sport" but leaving the gear lever in D. The trans is still "slow" in both modes but you get a bit higher shift-points. Thats not so exciting at all. Or another example is the manual mode: No matter what you have set with the DEC, it will always shift in the fast mode and rough. Some may like it, but it definitely restricts what the system could do. 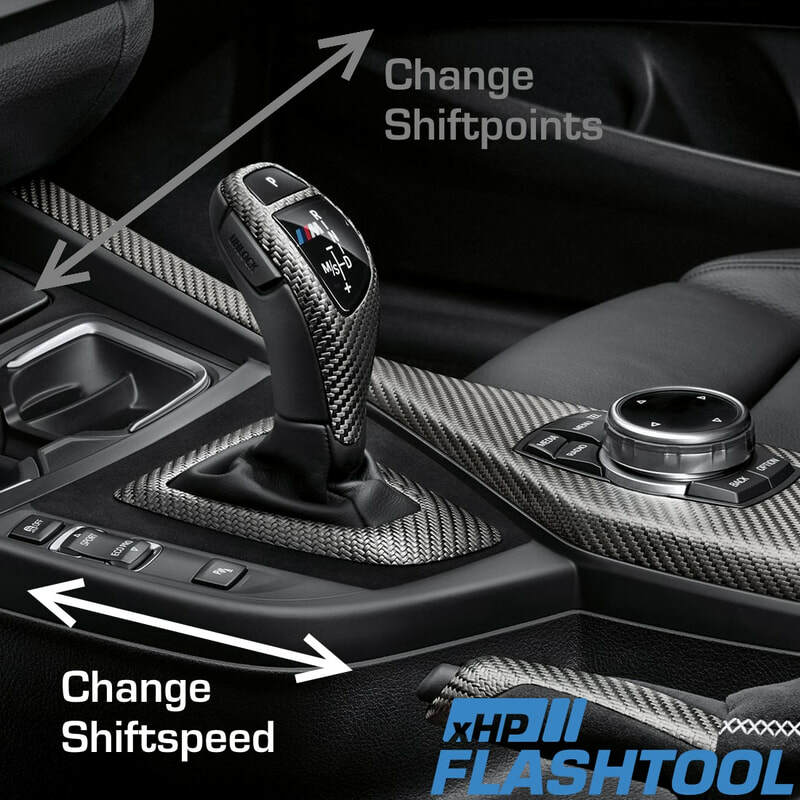 XHP Stage 2 calibration follows a simple rule: The gear lever changes the Shift-Points, while the DEC changes your Shift-Speed. You can combine it totally freely and make full use of what the transmission can do and not what marketing-department thought you should be able to do. Actually thats the way BMW does it in their M-Cars and thats the way we think it should be. So now that we have all modes accessible, what is that good for? Answer: You now have 3 different shift programs available in every operating mode. For instance, combining normal daily-drive shift points with rocket-fast shifts, creates a pretty awesome experience. You can feel all the torque the N55 creates in the lower to mid-range, while the shifts are so fast you can't even notice any lag between gears. On top, the trans creates that little bangs through the exhaust on every gear change. Or you now can access the fastest shifts possible in S-Mode with full auto-operation and do not have to use M-Mode for that. Last but not least you can also run your transmission in full manual mode but don't need to get your head jolted at each shift. Just use M+Comfort and the trans will shift reasonably fast but very smooth. Adding to this are hundreds of other small changes, that will make the trans a bit more driver-oriented and not so much economy focused. Being it accessing 8th Gear later in D mode (that lugs the N55 a bit) or showing you the actual gear always on the Dash. Even in normal D-Mode. It's too much to list and sometimes a bit hard to explain, without going into full detail of the trans logic, but in general our setups are generated through driving, driving, driving and not just by drawing lines or raising values at the computer. The Stage 3 file builds on top of that, but makes S combined with the Sport+ setting ready for roll-racing and the racetrack. As soon as you engage this mode, the trans will keep your RPMs above 4000 and won't upshift below 6500 RPM. This is especially useful in situation where you want maximum acceleration withouth having to think of the right gear by yourself. This mode can also be used on the Race-Track. It will shift just like a race-driver with a stick would do it. Hold gears all the time til the upper rpm range and aggressivly blip down by itself when braking into corners. You don't like all that? You think BMW already made it perfect for you, but you still need to get rid of the torque limiters in 3rd and 6th gear, so your engine tune can fully deliver? Then the Stage 1 is the right one for you. It keeps stock behaviour in all modes, but raises line pressure for high power cars and sets your torque limits to > 1000 Nm (which, of course, Stage 2 and 3 do as well). We can install this at our various dealers and mobile across the South East. Get in touch for a quote.